A long time ago I read about this sign being posted outside a Jewish synagogue and always wanted to find a picture of it! At the time I did Google searches to no avail as I wanted to include it as part of the book I wrote. It was until recently that I came across this picture! I find it so interesting. 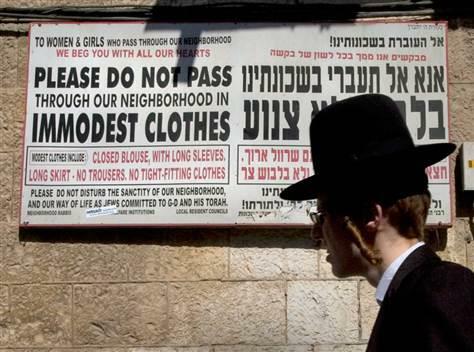 It’s re-assuring to know that the Orthodox Jewish people follow the standards of modesty to this day. It also shows that our interpretation of scripture with respect to the standards of modesty are correct and aren’t really some crazy rules recently made up by man. These principles were passed on to God’s people since the beginning and It’s lovely that modesty hasn't died out considering the decay of morality in the last century. It’s great to know that some people still stand strong on their convictions and foundations that God has placed for us for a successful Christian walk. 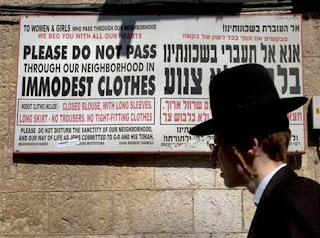 -sign posted in an Orthodox Jewish district of Jerusalem provides an interesting definition of modesty for women’s dress:” Passage permitted ‘only’ to women dressed modestly! Long dress, lower than knee length (no slacks).Long sleeves, beyond elbow length. Closed Neckline”(National Geographic, July 1985, p. 30). Thanks Wends for your lovely comment! Yes, I can only imagine how challenging it can be when you have been living a different way for so long, but God will reward your efforts and will give you the tools you need to live it thru and you're right, one day soon, you will not longer be trying, it will come very naturally. Love you!